We've chosen five young Canada-based designers and studios to watch, after seeing their work that includes a wooden ping-pong table and furniture made from mushroom mycelium at design events in Toronto. The Canadian commerce capital's annual celebration of design comprises two coinciding events. This year, the IDS Toronto trade fair took place at the Metro Toronto Convention Centre from 18 to 21 January, and the citywide Toronto Design Offsite festival ran from 16 to 22 January. Originally an architect, Louie George Michael moved to Canada to study cabinet making and primarily uses maple wood in to create whimsical products. In Toronto this year, she exhibited her lifeguard-like David Mazel Tov chair, which features two vertically arranged rattan seats oriented in opposite directions to one another. 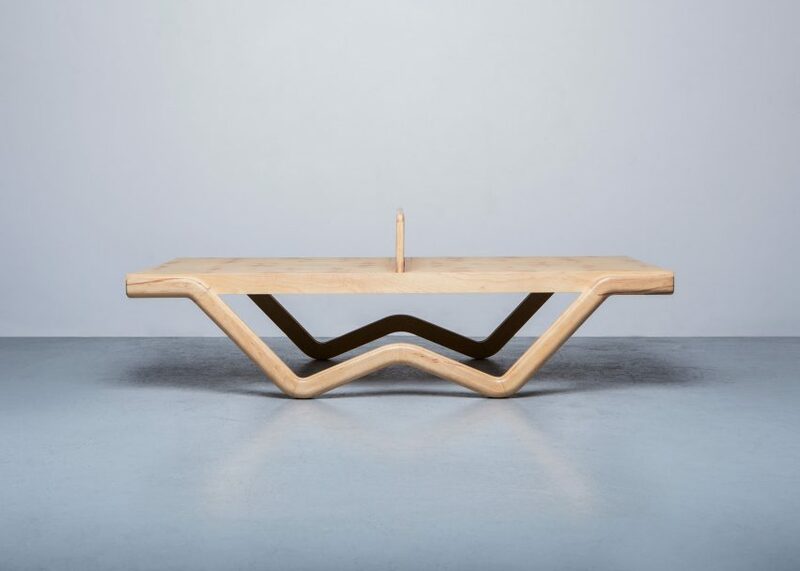 The designer's other products include the maple wood Tina Burner table that can also be used for ping-pong matches. "I try to make furniture fun by playing with scale and function," she told Dezeen. "I invent and create everything myself by using the inherent qualities of the material as the source of my concepts." 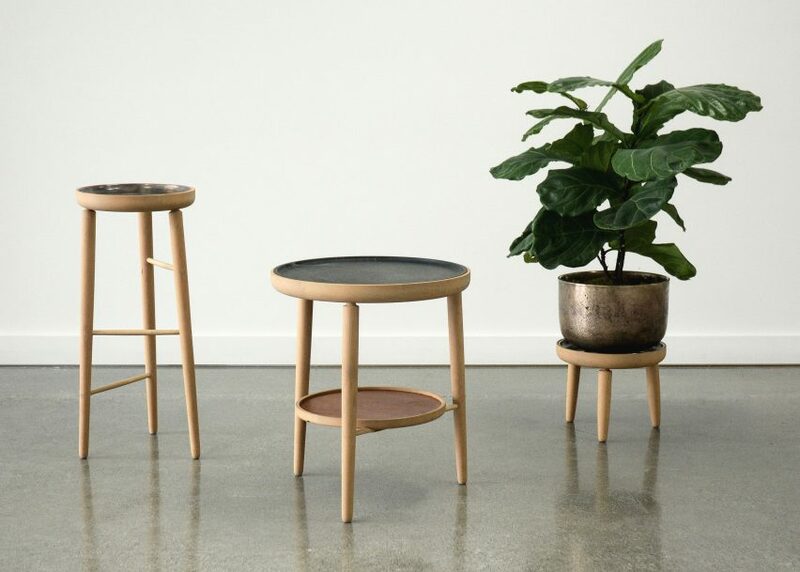 Jake Whillans combines wood with other natural materials – like tanned leather, cast bronze and soapstone – to create pared-back furniture and homeware. The Toronto-based designer's work includes the white oak Coracle bench, with a leather-wrapped seat base that doubles as storage space, that is modelled on ancient Irish fishing vessels. His Baré family of tables and planters that were exhibited in January were designed as an "exploration of roundness". "My process involves both digital and traditional modes of production – while an underlying consideration for the sustainability of my practice informs every decision I make," Whillans told Dezeen. 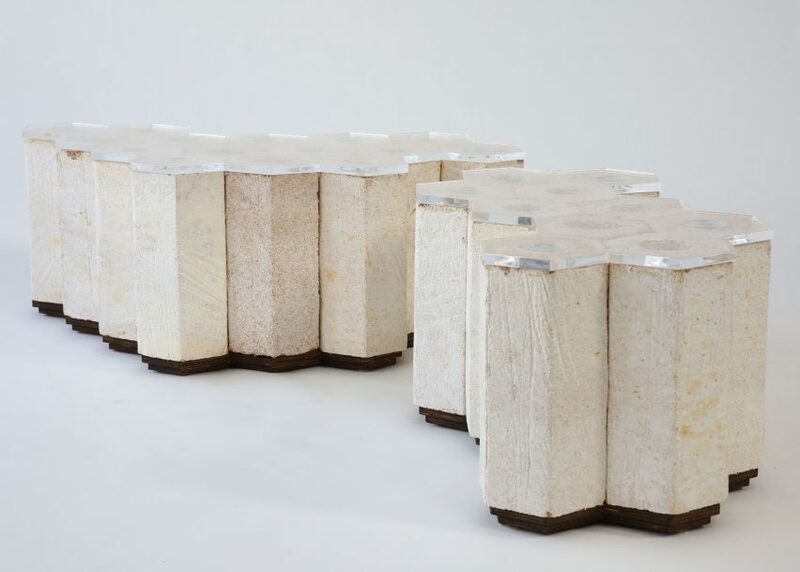 AFJD specialises in turning mycelium – a biodegradable material made from mushroom spores – into furniture pieces. Studio founders Amber Frid-Jimenez and Joe Dahmen have so far used the mouldable material to create honeycomb-shaped outdoor seating named Mycobenches, and an installation titled Mycelium Mockup that demonstrated the architectural capabilities of the fungus. "We work at the intersection of architecture and information design, engaging new technology in a feedback loop with materials to create provocative virtual and built environments," the duo said. "We like to work with systems that change and grow over time." Their Mycobenches were shown alongside Louie George Michael's chair and Jake Whillans' tables in the Living Well exhibition, on show at design store Craft Ontario until 18 March 2017. Founded by Christian Lo and David Ryan, lighting and product design studio ANONY's portfolio is dominated by circular forms. "We are really attracted to the shape because it seems to represent the most perfect geometry," said the Toronto-based pair. "We think it works great in lighting as it seems to provide a sense of balance and unity." 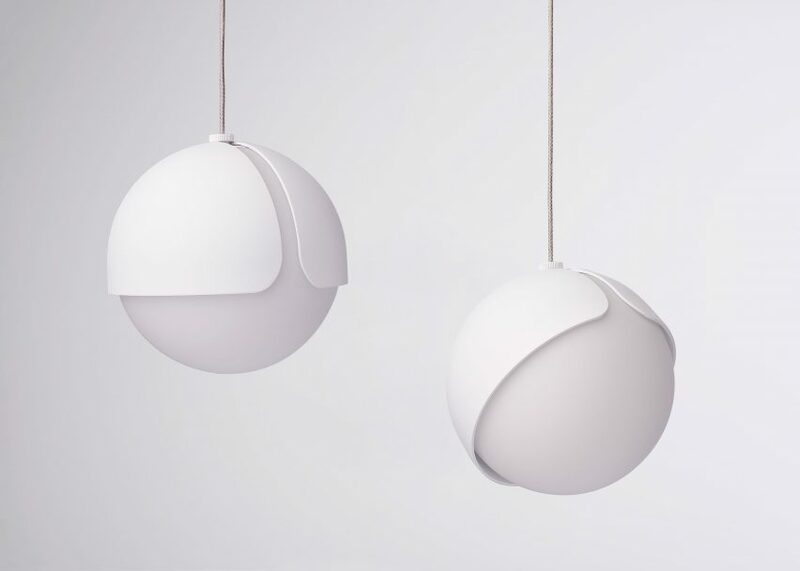 They have used round forms in the capped spherical Ohm pendants, and as draped shading elements over the linear Dawn lights. Mitz Takahashi is based Montreal but was born in Japan, and his heritage heavily influences the appearance of his designs. 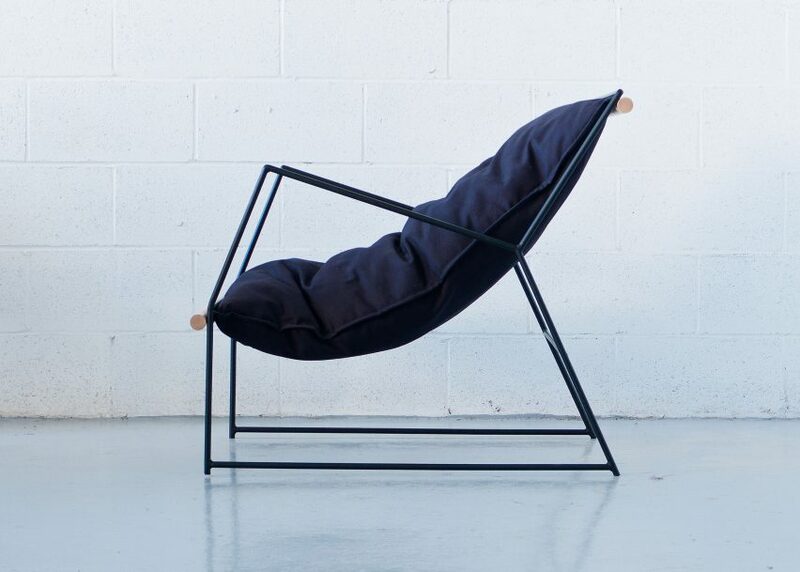 This can be seen in the Kumo chair, comprising a thin metal frame that supports a pillowy seat. "I tend to lean towards the minimal, so I focus on details for designs," Takahashi told Dezeen. "Every time I go home to Japan, it reminds me that Japanese aesthetics runs in my blood without even thinking about it." Takahashi and ANONY both exhibited as part of the emerging designers platform at IDS.